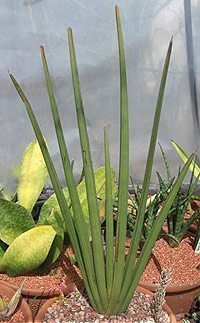 Used widely as an indoor plant and readily available for sale Sansevieria species such S. trifasciata, S. cylindrica, S. hahnii and S. laurentii are popular for the air purifying qualities. A widely used species is Sanseviera laurentii, pictured right. Way back in 1989 NASA performed some trial to test the efficiency of plants in purifying air in buildings Sanseviera trifascata was one of the better performers in this trial. 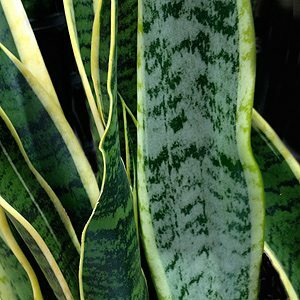 Sanseviera trifasciata are sometimes called ‘mother-in-law’s tongue’ or ‘snake skin plant’ because of its long tongue like leaves and the patterned foliage. Grown for their foliage Sanseviera make a good indoor plant. S. Cylindrica sometimes get the name “Fansevieria”. S. Schweinfurthii – Pencil thin green leaves and very upright in growth habit. S. aubrytiana – Mottled green and cream leaves, upright to 60 – 70 cm, similar to S. kirkii but with flatter leaves. Sanseviera sp. – ‘Pink Bat’ – Thick mottled foliage said to be a form of Sansevieria hallii. Grown mainly for the foliage although they do have fragrant flowers as well, and the indestructible nature, yes they are a drought resistant, and almost entirely disease free and pest free plant they grow well in a range of conditions from full sun to low light indoors. The range of plant forms and foliage is widely appreciated by landscapers.